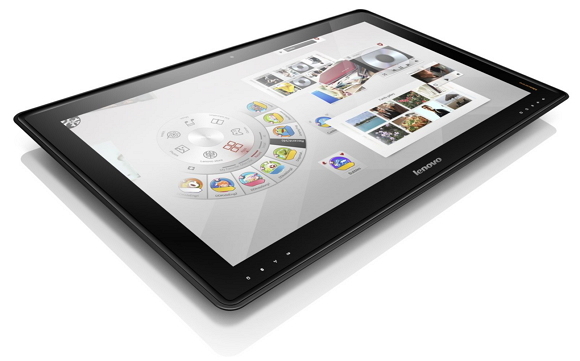 One of the World's largest PC maker Lenovo now introduces 27-inch tablet PC called IdeaCenter Horizon. It runs on newly arrived Windows 8 operating system. The device comes with a stylish and trendy look. It equipped with 27 inch full HD touch screen display with 1920X1080 pixels resolution. The table tablet total weighs 7.71 kilograms. The device running on 3rd generation Core i7 processor with Nividia getForce graphics and it is having 780p front facing camera making video chats. It has 8 GB of RAM and 1 Terrabyte of hard drive storage. It comes with many exiting games like Air Hockey. The IdeaCenter Horizon costs $1,699 and goes sale on this summer.